NEW YORK--(BUSINESS WIRE)--BMR Energy, a developer, owner and operator of clean energy projects in the Caribbean and Latin America, announced today its acquisition of a 4-megawatt, fixed ground-mount solar facility from NRG Energy, Inc. in St. Croix that was damaged during Hurricane Maria in September 2017. The company will take over the power purchase agreement and restoration efforts of the St. Croix solar farm, which sustained significant damage during last year’s hurricane. Along with the physical damage last year’s powerful hurricanes inflicted on the Caribbean region, Hurricane Maria also curbed renewable energy supply in the U.S. Virgin Islands (USVI). The St. Croix project has been running at less than 45 percent capacity for nearly a year. The reduced generation of damaged renewable energy facilities puts strain on the utility’s supply planning and ability to meet its clean energy goals. Richard Branson’s Virgin Group bought BMR Energy in 2016 and works extensively in the region with a network of partners. Alongside Prime Minister of Jamaica Andrew Holness, Richard will be hosting an event on August 9 championing updates on the Caribbean Climate-Smart Accelerator. The Accelerator brings together 26 Caribbean countries and 40 private sector partners representing a region of 1 million square miles and over 40 million people to help transform the regional economy by fast-tracking sound public and private investment that supports climate action and economic growth through sustainable development. “Restoring the solar facility in Spanish Town, St. Croix, to full capacity generation is core to our mission of supporting clean energy infrastructure in the Caribbean and Latin America,” said Bruce Levy, CEO of BMR Energy. “This acquisition is an opportunity to show how to build for stronger hurricane resiliency and offer greater value to the region. As the prolonged restoration in these hurricane-devastated areas highlights – with Puerto Rico being the most extreme example – we must remain committed to rebuilding our infrastructure right and successfully maintaining projects through long-term ownership.” The USVI solar plant represents an entrance into a third market for BMR, which currently has projects operating in two other countries in the Caribbean and Latin America: Jamaica and Guatemala. BMR is working closely with The Virgin Islands Water and Power Authority (V.I.WAPA), the local utility and power purchaser of the energy generated from the site, on its continued recovery from the effects of the 2017 hurricanes as a new hurricane season begins. A construction manager is already on-site repairing damage and replacing inverters at the St. Croix solar facility. BMR’s goals with the restoration process are to get the site restored for the most competitive price and as quickly as possible to accommodate V.I.WAPA’s planning needs. 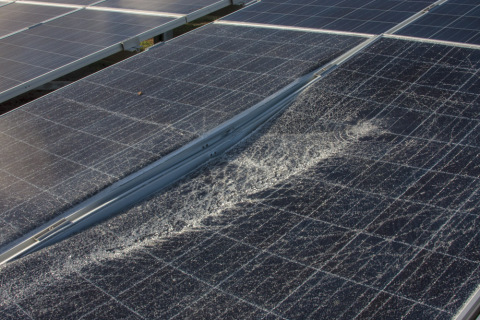 BMR is set to receive approval from the utility to purchase another hurricane-damaged USVI solar project in the coming weeks. BMR’s restoration efforts have incorporated local labor and several local contracting partners. When restored to its full capacity, the St. Croix solar facility will generate power for approximately 1,600 homes. BMR Energy expects to restore the St. Croix solar facility to full capacity by October 2018. BMR Energy, a Virgin Group investment, is a developer, owner and operator of clean energy projects in the Caribbean and Latin America. BMR Energy’s solution-minded team brings its industry expertise to efficiently executing projects that deliver affordable, sustainable energy generation. For more information, visit www.bmrenergy.com. Virgin is a leading international investment group and one of the world's most recognized and respected brands. Conceived in 1970 by Sir Richard Branson, the Virgin Group has gone on to grow successful businesses in sectors including mobile telephony, travel & transportation, financial services, leisure & entertainment and health & wellness.